This is our July design newsletter! Today I have the pleasure to introduce you to a friend of mine, John Dufficy, an incredibly talented furniture designer/builder and a rising star, whom I have met through my business. John Dufficy is an artist when it comes to building his furniture. 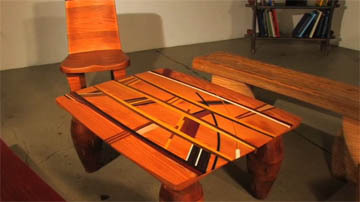 Get acquainted with John's work and his unique style of furniture. I am also proud to announce my involvement in the Green Movement as a designer. I have become a part of a team working on a new website which will be promoting Solar Lighting for your Homes. Check out our Green Corner for the latest updates on Green Power! Remember, it's never too late to become friendly with the environment and to save on your electric bill at the same time! How many of you have a piece of furniture in your house that you absolutely love? And how many times have you tried to find something to match it or to even get close to its quality and were not able to? Well, maybe it’s time to find a furniture designer and builder who can help you to get out of this frustration and create one of your own pieces. I’ve heard a lot about John’s work from my friends but was not sure what to expect. After I finally saw John’s furniture I am still not able to describe fully the beauty and caring with which John creates his work. 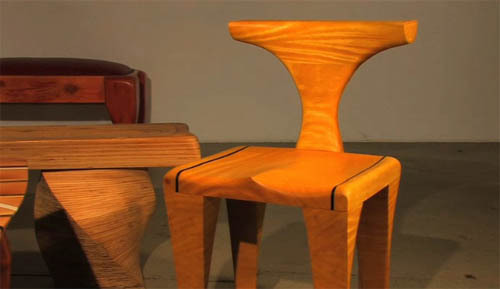 How can someone get inspired to create something this distinctive and stunning with wood? Each piece is very unique and has a story behind it. 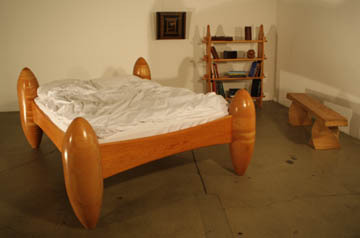 John’s studio is filled with tables with zebra-like legs, fairytale beds and curving picture frames. “Both my grandparents were carpenters and many of my uncles followed in their footsteps, so you could say it is in my blood. I received a distinction in the London college where l learned my skill. Since then I have traveled the globe working mostly as a carpenter, spending much of that time in Germany Australia and New York before settling in San Francisco. John, what is your dream project? - My dream project is every time I come together with a potential customer and we let our imaginations get the better of us. From there we take as few steps backwards as possible to be within the limits of materials, practicality and cost. Why do you love doing what you do so much? - There is no feeling in the world to compare with the creative rush of making something that has not been made before, pieces people can use everyday and that will have a life far exceeding mine. What is the style of your furniture? 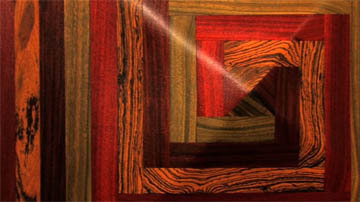 I’ve noticed you use a special method of putting different pieces of wood together to make one piece, is there a name for it? - I do not think there is a name for the method l use or the type of furniture I make. I like to think of it as bringing together beautiful species of wood so they enhance each other. Does saving the planet sound like a task too big to handle? Perhaps. But we have the choice to do what we can to make less of an impact at the individual scale, and this is a good start. There are many ways we as individuals can move into the future and assure that we are making a difference for the planet. Things such as purchasing products that are made of sustainable materials, less toxic to the environment and have an overall longer usage life are simple ways that we as consumers can do our part for our planet. • Solar Energy is a renewable resource and is there every day, unlike fossil fuels. • Solar Cells are completely silent when producing electricity. • Solar Energy is non-polluting. • Solar Cells require little maintenance; there are no moving parts that need to be fixed over time. • Solar Cells save you money over long run. • Solar powered lights are easy to install and do not require wiring. • Solar Cells can last a lifetime. • Solar Energy is perfect for remote locations where there is no access to any other means of electricity. • Solar Power technology is improving consistently over time. INTERESTED TO LEARN MORE ABOUT SPACE DESIGN?